UPDATE: GamePro is gone, and so is the link for the article. Sorry! GamePro.com has posted my article from a recent print issue on The Psychology of Loot. The article aims to look at what psychology has to say about why gamers love loot and loot drops so much. Turns out it’s not so much the loot, or even the loot drop. What really gets us is the anticipation of the loot drop. Nobody every thinks of the donkey in these situations. German born neuroscientist Wolfram Schultz was conducting research at the University of Fribourg in Switzerland on the relationship between the chemical dopamine and Parkinson’s disease when he almost accidentally started a line of research that can be used to explain gamers’ love of loot. Dopamine is a collection of just twenty two atoms that plays a huge role in regulating human decision making, particularly goal oriented behavior and the pursuit of pleasure. When we encounter something we like –say a patch of berries or a goretusk liver– our brain releases dopamine. Brain cells that are sensitive to that chemical go bananas when it’s present, which makes us feel good –maybe even euphoric. Dopamine neurons in the brain also help us predict good things in life. Schultz and his colleagues discovered that presenting a lab monkey with a bit of fruit caused the creature’s dopamine neurons to light up. They also discovered that when they repeatedly preceded the treat with a light or a sound, the neurons would start to fire when the monkey saw the light or heard the sound, but then remain relatively inactive when the fruit showed up. The system they had discovered was, at its core, about anticipation and trying to predict rewards based on what was happening in the environment. I have to say that not only do I like how this article turned out, it’s actually my favorite thing that I’ve written on the topic of the psychology of games in a while, even though it’s essentially an expansion of one of the first articles I wrote for this site. There are a few reasons for this. First, the GamePro article features the phrase “saucy pictures of lady monkeys.” Really, that’s enough right there. But second, it features some quotes from one of my favorite science writers: Jonah Lehrer. I just e-mailed him out of the blue asking if he’d like to give some comments on the subject for the article, and he was kind enough to oblige. Since I started doing this stuff I’ve been repeatedly and pleasantly surprised by how willing authors, academics, and game developers can be to write me back and help out. In fact, just recently I had a nice phone conversation with another one of my favorite science writers, Dan Ariely, who helped me formulate some of my thoughts on my latest article in progress, which deals with the psychological trickery behind Xbox Live Arcade’s Microsoft Points system. It’s weird, but I’m much more glad to have had the chances to talk to Lehrer, Ariely, and the various game developers than I would have ever been talking to some movie star or musician. 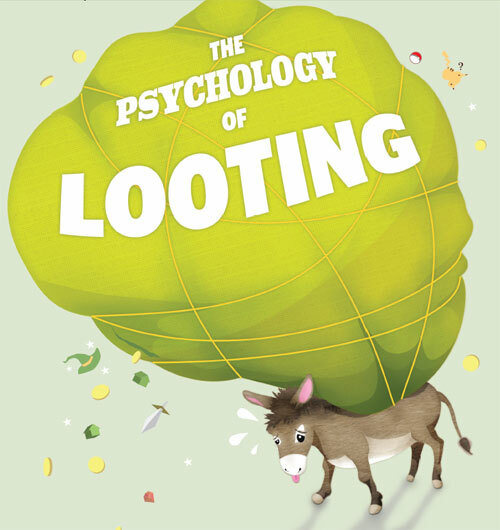 At any rate, here’s the link to the article on the psychology of loot in case you missed it the first time. Enjoy and let me know in the comments what you think of it. More thrilled to talk to really intelligent people who are discovering the many ways we can all make the world a better place, instead of celebrities? Those guys are the REAL celebrities. Just look at the audience’s reaction following a TED Talk or its ilk. It’s no shame to go squee when you get to share skull time with really smart, dynamic people. I envy you! Yep, and interestingly it’s the same mistake I keep seeing places like MTV and Spike make when they try to cater to gamers. We have our own heroes. At least some of them must be camera ready. I think this is one of the most interesting subjects in the psychology of gaming. A guy (forgot his name) did a videon TED about why gamers are so in love with “loot” and the tedious work required to earn it. Awesome blog by the way, just came acrosss it! I haven’t read your article yet, but offhand, I think you might be on to something here. If the pleasure of anticipating a loot becomes the reward per se as you point out, then it runs consistent with the incentive-sensitization theory of addiction which states almost the very same thing. It’s the anticipation, and not the pleasurable effects after, that gets a gamer going for more. I have just read your articles in gamasutra and was redirected here. Congratulations on the blog, it is really interesting and well written, mixing humour with academic thoughts is greatly achieved. I don’t think it is weird to feel more satisfaction talking to guys like Dan Ariely instead of a movie star, I would even go further stating that it would be weird otherwise!